We'll have V6 before it's NEEDED, even by a small number of users. So how's that NAT444 going? yitz: Will the VLAN tagging configuration be changing?? No changes planned regarding VLAN tagging. Our UFB connections will remain untagged. Feel free to pick up my mantle of Hawaiian shirts during CEO kitchen chats. It will add to your credibility. I've got had your back. But in all seriousness. 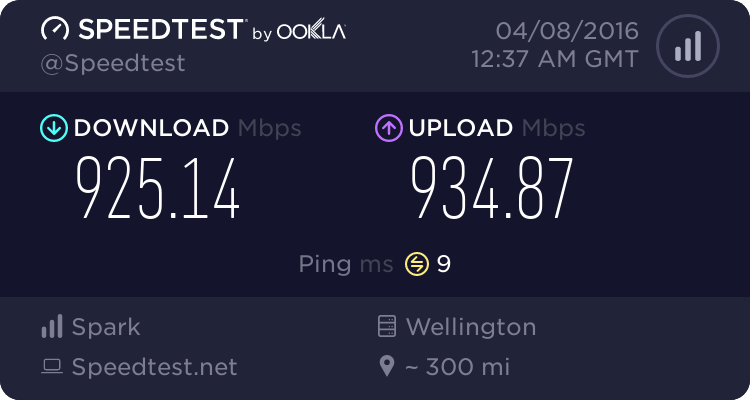 If a few people here are posting saying they prefer a worse broadband experience with IPv6 vs a SIGNIFICANTLY improved international download and overall experience even though the speed test will show the same number then sure... ok... whatever. Please hand in geek credentials to your nearest shop assistant as you exit the gift shop. While I agree with what the Sparklets are saying here I do see other peoples frustration. What really set BigPipe apart was their ability to do things that Spark couldn't do. A few of these were the BigPipe app with QoS (which I know would never scale), IPv6 and IPoE as well as having good email support. This did indeed go downhill when Skinny Broadband launched. Really, I feel the correct approach to this would have been keeping BigPipe on its own network until this featureset was available on Spark (then moving) and just moving the people from Skinny over to free up capacity on BigPipe's network who wouldn't care. Right now, there is little point of BigPipe existing considering it is just essentially "reselling Spark". Yes, I know the Spark mothership has a great network and all but there are several things that are holding them back with the times. Vodafone has IPv6 and is enabled by default on the Vodafone Homehub (got the shiny IPv6 icon on Geekzone and all when I was using it earlier today). Other ISP's do too but I really feel better planning could have gone into this. I know there will be customers of BigPipes using something like a Mikrotik that won't achieve full speeds with PPPoE enabled and even customers using Apple gear who would see a drop in speeds also. I had problems with the Ubiquiti USG last year dropping its PPPoE connection and it was nice there was a way to work around this with IPoE. While IPv6 is not essential it was a bit of icing on the cake. That is my 2c. There is a huge advertising push for Skinny Broadband at the moment and I feel this is where a bulk of the load is coming from now. It makes sense, but at the same time doesn't make sense. People can argue this all they want but to be honest I agree with both sides of the story here. BigPipe customers are indeed moving to a better network but at this point there is no reason to stay with BigPipe now considering there are other options out there. Something interesting I stumbled on the other day was this PDF and is well worth a read - Is IPv6 only for the Rich? kiwibob1: Respectfully the amount of IPv4 address space that Spark has is not the issue. The real issue is that there is a very small but growing part of the internet that is IPv6 only - where ISPs, developers or whoever cannot get IPv4 for practical or financial reasons. Come the day your customers will discover that they cannot reach these services, be they web sites or something else. This is the reason most (all?) of the large content providers have migrated to dual stack. I would love to know this part of the internet that is IPv6 only. There is literally no service of any significance that runs only on IPv6. Since by having that approach you would be cutting yourself off to the vast majority of customers on the internet. Sure there is the ongoing shift towards v6. But once you excluded local CDNs (which would deliver service equally as well over v4), plus Facebook I would be very surprised if the traffic represented more than 5% of all traffic. And only a very small minority of customers are pure V6, with them primarily being Mobile as that does make sense to deploy IPv6 for mobile and then you offload traffic from your CGNAT as CDNs/Facebook represent the majority of traffic and you would then be purely routing the IPv6 traffic rather than needing expensive CGNAT boxes. Most are dual stack and will always have a 6to4 gateway somewhere in there doing the CGNAT to the IPv4 network. The problem is that web & app developers in conjunction with router providers have got extremely good at navigating v4 (using uPNP among others) that the *need* for IPv6 just isn't there. This is me having setup IPv6 within Spark almost 6 years ago (Check my Geekzone badges @bartender ) and had been battling for it until I left. No killer IPv6 application exists. So if I had to choose between deploying more CDNs, upgrading hardware, core links or handovers for more resilience or capacity, tweaking the customers profile to squeeze out the best international performance, supporting new parental control services.... and deploying IPv6 when there is so little chance of running out of IPv4 in the next 4+ years. I know where the priorities would be. Again my personal opinion as I don't work at Spark anymore. Edit - A few updates for clarification. You are right. You might find the internet Society's "State of IPv6 Deployment 2017" interesting. It substantiates many of your points but has quite a lot of additional data about various IPv6 transitions and the drivers behind them. An example of a transition is Facebook who have migrated their datacentres to IPv6 only and have observed that accessing Facebook can be 10-15% faster over IPv6 (IPv6 It's Time to Get On Board). To paraphrase the report: The reality is that IPv6's “killer application”, is the operational simplifications that reduce the cost of operating the network and remove the complexities introduced by network address translation. Finally I don't believe it's a choice between IPv6 and network upgrades. Today everything should have IPv6 turned on and tested as part of it's implementation. Anything that doesn't support IPv6 is probably end of life anyway and ought to be retired hopefully before it gets hacked. Fortunately I'm not affected by Bigpipe's withdrawal of IPv6 but I understand the concern of those who are. I use IPv6 to test connectivity/performance of the websites that I run, without it I'd be reduced to using third party tools. I'd be unhappy if I was locked into a contract and part of the service I use, albeit a beta trial, was withdrawn. Why? Well my experience is that pretty much most beta trials go into production at some point (think gmail). Does Spark peer with Cloudflare in NZ, or does that traffic all still go to Aus? Goes via Aus, at least in tests I've done. Lorenceo: Goes via Aus, at least in tests I've done. And there is someone on this thread that could sort that. So if you had to choose between v6 and Cloudflare peering which would you choose? See the problem with resource allocation and prioritisation. Big Red seem to have no problem doing both? Although in the case of Cloudflare I don't think you're missing out on much it ends up going via Aus half the time even if you having peering in NZ anyway. Must be all the poker chips clogging it up. Just wanted to give a quick shout-out to voyager.nz (@VygrNetworkMonkey). I've signed up with them, already have my static routed prefix assigned, with reverse DNS delegated to my nameservers, and they made every effort to ensure that the transition from Bigpipe at the end of my current billing term will be a matter of a few minutes only. Now I wish I had known about you guys years before, and I'd have saved myself a lot of trouble with the Bigpipe IPv6 beta, and paying $49 for a static IP. For new deployments I absolutely agree with you. But I do understand the pain of trying to retrofit IPv6 onto existing, legacy systems without also disrupting those systems. For example in my own ISP days we knew we had the technical means to enable IPv6 for most customers, because our equipment was technical capable of dual-stack. But additional tooling such as bandwidth counters / accounting systems, auto-provisioning systems, Firewall and ACL rulesets, and even such simple things as training for staff, all need to be considered. General knowledge of IPv6 is still poor, even amongst the developers who write or maintain systems that need to talk over IP. When the means of connectivity (v4 over v6) is not a revenue-generator, deploying v6 basically becomes a cost-sink for anyone who needs to do it retrospectively, and so it tends to be done progressively / as part of other planned works. I was very glad to read in this thread that Spark do intend to deploy v6 eventually, withdrawing an improvised version of the service in order to simply the future deployment of a better, native solution would seem to be viable (if disappointing for some). As for the v6-only Internet, in the content-vs-consumers world the people who care about content accessibility will usually want to cater for the v4 internet as well, so therefore there's unlikely to be a lot of content that's not v4-reachable. At some point this will change, but i'm not aware of any evidence of this yet. More recently I was involved in a corporate network that also served web content to a large swathe of people world-wide. IPv6 reachability and thus IPv6 support, wasn't even on the radar; internally the corporate network wasn't short of RFC1918 IPv4 and externally there had been essentially zero reported issues with content that was only v4-reachable. So where's the motivation to spend time and resource working on that, instead of other priorities, projects etc? (IPv6 was on the list, it just never found itself at the top of said list). So this is not cut-and-dried.
. . . well my experience with bigpipe has had a very big turn for the worse, internet failed last Thursday afternoon, support call logged, six hours to respond, endless "At the moment our Customer Care team is helping with an extra-high volume of customer enquiries, and it’s taking a bit longer than usual to get to your email". Still no response to email today. uh, bigpipe are email only?